One of the reasons I started this blog was to encourage me to try new things. Last week, these new things came in the form of goat. Y’see, TC has bought a new game called A Distant Plain. And he won’t. Stop. Playing. It. It’s constant. We don’t have a dining table, we have a gaming table (not that I have a problem with that, games rock). It’s a four player game, but thanks to the marvel of flowcharts, he can play it all on his lonesome – which he’s done about four or five times. I’ve played a two-player version with him, and on Saturday he invited round three of our friends to play with him. The game is set in Afghanistan, so I decided to cook an Afghan dish to serve for dinner (because why not). And, as I was reliably informed, that meant goat. I could have chosen another meat, but I am nothing if not adventurous! I put “Afghan food” into google, and one of the top hits was this recipe. Giving it a skim, it looked straightforward enough. I just needed to substitute goat for the lamb. Task one was to locate the main meat. I managed to find goat quite quickly at Kirkgate Market (on Bennett’s stall, which also feature pigs trotters and oxtail! ), and decided to pick it up on my way back from town. Sainsburys supplied the rest of the goods. Garam masala and cardamom aren’t actually spices that I naturally keep in stock, so I had to buy fresh. And luckily I’d done a bit of further research on the ingredients on the list – when sella rice wasn’t anywhere to be found, I remembered that it meant parcooked rice, and bought some of the easy cook rice that only takes 5 minutes to boil. This would be a breeze. Unfortunately, the market had shut up in the time I’d been in town, so I had to return the next morning, a decision that nearly scuppered all my plans… But still, over a kilo of goat for £7? The markets are such a bargain. And I got some free cooking advice from the butcher – that it’s similar to cooking lamb, but cook for longer. This is where it gets tricky. Like, the whole way along the cooking process. 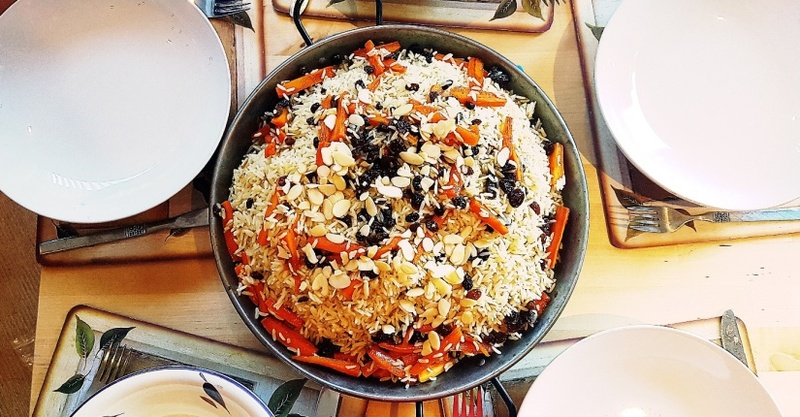 Parcooked or not, the rice had to be soaked overnight – and it asked for 1kg for 6 people, which was a hella lot. The next lunchtime, after picking up my goat, I got to work. Step one was to sear the goat. The nice man at the market had chopped up the goat into large pieces, and it was still on the bone, which made browning it a bit of a task – my giant pan was too small! I was also constantly worried, considering the many times I’ve been warned about cooking goat too quickly. Goat seared, it went in the slow cooker. The slow cooker is my favourite thing in the world. I topped it off with water (not as much as it asked for in the recipe, 2 litres is a loooot of water) and set it to high. I was hoping to get in four hours of cooking – but it was already 2pm somehow! I also decided to cook my carrots now. These were my favourite part of the dish – sticky and sweet and spicy. I’m not generally a sultana fan, but they totally worked. Things started to get manic four hours later, when my guests were getting hungry. I definitely needed another two hands, but the ones attached to TC were busy gaming and very distracted when I asked him to drain the rice. Cooking the megaton of rice required two pots. Then it was into my thankfully huge bowl to mix with the sugar stock and spices, and back into separate saucepans for the final stage. Drizzling over the oil… placing the lamb and carrots on top of the rice… covering with the tea-towel and placing on high heat, then low heat, then no heat… honestly, I’m not sure how much this added to the finished taste of the dish. This is where I got a chance to have a bit of flair. I decided to serve it up in my paella pan, and followed the presentation instructions in the video to the letter – a thin layer of rice, topped with the lamb, followed by more rice to hide the lamb completely. The carrots and sultanas spooned over the top, and a sprinkle of flaked almonds (I omitted the pistachios). Voila! I have to say, this has given me the nicest food photos I’ve ever taken. I think I’ve reached my peak. I asked my guests for their blunt feedback, and it was still all very positive. They complimented the subtle flavours of the rice, and said that the goat itself was “as tender as they’ve ever actually had goat”. TC commented that it was quite similar to how he had goat when he was in Africa, so I guess that’s all you can ask for. On my part, I’m really not sure it was worth the effort. It was definitely a tasty meal, and so so so Instagrammable, but I wish I’d used lamb instead. A lot of the tricky stages almost certainly added to the flavour of the dish, but I’m more of a bold brash, in-your-face-with-taste sort of cook. Have you ever cooked goat before? How did you find it? What should I cook next for the first time?